We’d love your help. Let us know what’s wrong with this preview of When My Sister Started Kissing by Helen Frost. To ask other readers questions about When My Sister Started Kissing, please sign up. Claire always loved spending summers at her family's lake house. She felt close to her late mother there, but this year is different. Her father and new stepmother Pam have cleared out all of her mother's belongings. They are expecting a baby and for them a new and exciting period has started. Claire hopes to find support with her sister Abi, but Abi has other things on her mind. She has just discovered that boys are liking her back and she regularly sneaks out to be with someone she finds more Claire always loved spending summers at her family's lake house. She felt close to her late mother there, but this year is different. Her father and new stepmother Pam have cleared out all of her mother's belongings. They are expecting a baby and for them a new and exciting period has started. Claire hopes to find support with her sister Abi, but Abi has other things on her mind. She has just discovered that boys are liking her back and she regularly sneaks out to be with someone she finds more interesting than her sister. Claire spends a lot of time on her own and keeps having to cover up for Abi. Claire is feeling lonely and left out, but is this really justified or are her own actions also part of the problem? Will her summer be a disaster or will she be able to have fun in a different way by giving new experiences a chance? Claire and Abi were always really close, but Abi is older and she's discovered boys. Pam is someone Abi can learn from, while Claire doesn't want to have anything to do with her. That's a fantastic subject for a story. I could easily feel Claire's pain and frustration. Everything and everyone around her is changing and she desperately wants things to remain the same, because she misses her mother and doesn't want to let go of the past. I loved the way Helen Frost explores her feelings. Claire is more sensitive than her sister and this gives quite a bit of friction, but there's a lot of love as well, which is the first step towards making things right. 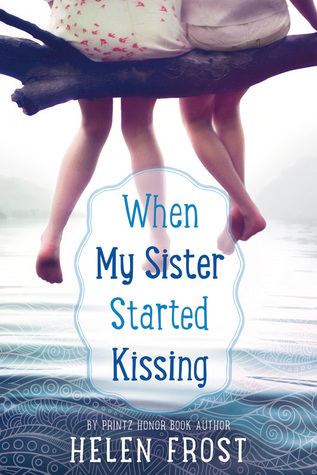 I love books about siblings and When My Sister Started Kissing is definitely a good one. A thoughtful verse novel about two sisters, Claire and Abigail, and their annual summer vacation at the family cabin at Heartstone Lake. The story is told from Claire, Abigail, and the lake's points of view with each perspective using a different poetic form. This is a carefully crafted coming of age narrative about mothers, sisters, and the cycles of life. Claire and Abigail love coming to the lake. It is a large part of their family, especially since their mother died there in a lightning strike. This year, their father has remarried, and their stepmother Pam is pregnant. Claire is also distressed that her sister, who wants to go by Abi, is more interested in boys than in hanging out with her, and is alarmed that Abi is not following the rules, but sneaking out to meet the boys. Both girls struggle with their new circumstances, but find a way to finally move on after their mother's death. Strengths: I love Frost's poetry, and the fact that she uses forms and describes them at the back of the book. The poems are all very beautiful, and the characters are well developed. Summer stories, as well as romances, are always a good bet. Weaknesses: Considering the girls were very young when their mother died (Claire was an infant), it seemed a bit odd that they were still thinking about her so much. The story of two sisters growing apart would have been enough of a downer without this facet. Premise/plot: If you read many verse novels, then chances are good you're familiar with Helen Frost. When My Sister Started Kissing is her newest verse novel; it has multiple narrators. Claire and her older sister, Abigail, have always spent the summer at the cabin with their dad. First sentence: The baby, Claire, in a sunsuit and yellow hat, sat on her father's shoulders, the great wide world spread out before them. Two egrets flew home to their nest as thunder rumbled, far off in the distance. This was a quiet, unassumingly powerful piece. Told from the perspective of Claire, her sister Abi, and the lake they visit every summer, this verse novel sheds light on what it's like to grow up. The girls have been coming to the lake house every summer since they were little, but their mother died there when Abi was 3 and Claire not quite 1. Now, it is 10 years later and they are returning with their new step-mother who is due to have a baby any day. Claire no longer knows where she fits in th This was a quiet, unassumingly powerful piece. Told from the perspective of Claire, her sister Abi, and the lake they visit every summer, this verse novel sheds light on what it's like to grow up. The girls have been coming to the lake house every summer since they were little, but their mother died there when Abi was 3 and Claire not quite 1. Now, it is 10 years later and they are returning with their new step-mother who is due to have a baby any day. Claire no longer knows where she fits in the family, Abi is suddenly in the midst of liking boys, kissing boys, and sneaking out to meet boys, and their dad has no idea why they would miss all of their mom's stuff that used to clutter up the cabin. Told in a variety of poetic forms, this was a lovely little read that lets you escape back into the freedom of a summer at the lake, while knowing that every year you come back something will be different. I feel like I should like this author's work more than I do. I keep trying, and I admire what she sets out to do, but the overall effect is always flat for me. I feel like she has no sense of humor. I'm pretty sure it's just me though. I think others might well love this book! A pretty cute story (in poetry) of growing up. This was a sweet, gentle story about two sisters at their summer cabin, told exclusively through poetry and prose. I would imagine it could be a great teaching support for middle school English teachers everywhere. I really enjoyed it. I feel like the author got everything right-- the slight neglect from sleep-deprived parents, the teenage angst, the awkwardness, the bond between family... it all felt very authentic. This is a book writen in verse and is realalistic fiction. This book is about an 10 year girl named Claire her 13 year old sister named Abigal her dad and their new step mom with a baby on the way. This story is in the point of veiw of both Charlie and Abigal showing both sides of whats happening. Charlie and her family are going up to their cabin for part of the summer. Things have started to change since Pam (the stepmom) entered their lives. One day Pam takes Abigal shopping and she comes bac This is a book writen in verse and is realalistic fiction. This book is about an 10 year girl named Claire her 13 year old sister named Abigal her dad and their new step mom with a baby on the way. This story is in the point of veiw of both Charlie and Abigal showing both sides of whats happening. Charlie and her family are going up to their cabin for part of the summer. Things have started to change since Pam (the stepmom) entered their lives. One day Pam takes Abigal shopping and she comes back with a whole new look, style and aditude and that is just the start. Claire has tryed her best to understand the new Abigail but misses the old one at the same time. Soon after Abigails transformation Claire finds out a secert about Abigail. She decided to look deeper into it and finds way more secrets then she expected. This was a nice book. It is not suspenceful or sad, just a cute book. It is a nice book to read over the weekend. I feel like the auother did very well of writing this in the perspective of a 10 and 13 year old girls but, I feel like the book was a little boring for me becasue there was no cliff hangers or suspence. I feel like the auothor could have put a little more excitment into the story line but, I loved the book over all. I'm a sucker for novels told in verse, and this one was no exception. I'm always amazed at the thought that goes into creating novels like this one. I am also happy that I've still got it in me and caught the William Blake connection right away. That always makes the English major in me happy. I liked the different poetic forms and perspectives (the lake had an interesting perspective) and the setting. The first two pages reeled me in from the start. If it wasn't so darn depressing, it would be a I'm a sucker for novels told in verse, and this one was no exception. I'm always amazed at the thought that goes into creating novels like this one. I am also happy that I've still got it in me and caught the William Blake connection right away. That always makes the English major in me happy. I liked the different poetic forms and perspectives (the lake had an interesting perspective) and the setting. The first two pages reeled me in from the start. If it wasn't so darn depressing, it would be a great mentor text for story beginnings. Most of our books by Helen Frost don't circulate as well as they should. I pushed Salt toward the end of the year and got a couple readers. With a little hand selling, I think this one will go out okay. This novel in verse is told from 3 different perspectives: Abi, Claire, and the lake. Each voice is in a different poetical format (which I did not notice until I read the afterword). Claire, Abigail (who now wants to be called Abi) and their dad have always spent a month at the cabin on the lake every summer. A terrible accident there involving their mom happened when Abi was little and Claire was just a baby, but they still go every year. Now dad has remarried and Pam is expecting a baby any da This novel in verse is told from 3 different perspectives: Abi, Claire, and the lake. Each voice is in a different poetical format (which I did not notice until I read the afterword). Claire, Abigail (who now wants to be called Abi) and their dad have always spent a month at the cabin on the lake every summer. A terrible accident there involving their mom happened when Abi was little and Claire was just a baby, but they still go every year. Now dad has remarried and Pam is expecting a baby any day now. All these changes, plus the fact that Abi is interested in boys, make things really hard for Claire. Sweet story about sisters and family. This review has been hidden because it contains spoilers. To view it, click here. When My Sister Started Kissing by Helen Frost is a great, entertaining book for young teens. It told a great story about the connection between sisters and how their bond became stronger over the course of an interesting summer. It all starts on a lake where Claire's family goes every summer. In Claire's family there is her dad, her stepmother, her older sister Abigail and herself. Every summer they go up north and spend a month at the lake. They have done this since they were little, they even k When My Sister Started Kissing by Helen Frost is a great, entertaining book for young teens. It told a great story about the connection between sisters and how their bond became stronger over the course of an interesting summer. It all starts on a lake where Claire's family goes every summer. In Claire's family there is her dad, her stepmother, her older sister Abigail and herself. Every summer they go up north and spend a month at the lake. They have done this since they were little, they even kept going up there after their mom died. When they first get to the lake neither one of the girls are very interested in doing anything, but Abigail spent one day with their stepmom and now has changed into a whole different person. She likes boys and the boys like her back. Through the course of the summer Abigail shortens her name to Abi and starts sneaking out to see the boy she likes, Brock. Claire start to feel sad and lonely because she feels like everyone has forgotten about her, she thinks she only has her dad left, but he's always dealing with the newborn baby. When Abi starts to have trouble with boys Abi tells Claire everything, Abi can't decide between Brock (the guy she just met) or Tj (the guys she's know forever and is family friends with his family). Claire is starting to get annoyed because Abi just expects Claire to cover for her, but Claire just keeps getting left out. Claire has no interest, through most of the book, in bonding with her stepmother either. The conflict in this book is how Claire felt kind of alone and how she thought she was losing her family, another conflict I see in this book for Abi is the boys and how Abi has to decide on these two boys she likes. I think Claire is trying to solve the conflict by creating any connection she can with her sister, also by spending time with her stepmother and the baby and she ends up realizing they weren't that bad. Abi is solving her conflict by talking it out with her sister and but seeing how it all played out, and how she was feeling. At the end of the book she went with the boy that she knew was right for her. I think that the author definitely delivered her primary purpose, it was very entertaining. There was not a part of the book where I was bored. I think she taught a good lesson, which is to keep those important relations and connection with the important people in your life. I think the text was beautiful, not only did she tell a good story but the way they book was formed. First, the text was in poetic form and I thought that has a impact on the mood of the book, it made the book always feel calm. Second, in the book she had different point of views telling the story, there was Claire, Abi and the lake all telling the story. The strengths in this book was how it was targeted towards a age group and was very entertaining, also is had different emotions in the book which I thought was very nice. There was heartache, loneliness and happiness and much more. The weaknesses in this book for me was how there was secret messages in some of the pages and I didn't like how I had to go back on that page and try and figure out the message also I think there should have been more parts where Abi talked, I feel like it was more of Claire telling the story. Yes I agree with the conclusion, I think it was a happy ending for almost everyone in the book and I think that book needed a happy ending. When My Sister Started Kissing (Farrar, Straus, and Giroux, 2017) is a coming of age story involving two sisters—Claire (10) and Abigail (13). Having lost their mother at a very young age, Claire and Abigail have always been close, and until now, they've always enjoyed their summers together at the family lake house. But this year things are different. Mom's belongings have been replaced by a new stepmom and a baby on the way. Also, Abigail is exploring her identity, her independence, and her bud When My Sister Started Kissing (Farrar, Straus, and Giroux, 2017) is a coming of age story involving two sisters—Claire (10) and Abigail (13). If you're familiar with any of Helen Frost's distinctive novels-in-poems, you already know the importance she places on using language and structured form to help convey story. For her, the structure of poetry and the sound of language is a "precise paintbrush" used to illustrate the essence of different characters. For example, in When My Sister Started Kissing, Claire's rhyming quatrains are set against Abi's free verse poems that resemble lightning; Claire's kayak poems show movement through water; and then there's my favorite—the voice of the lake. Lake poems are centered on the page to appear lake-like, but they are also acrostics. Reading down the first letters of each line spells out lines from other poems by William Blake, Gwendolyn Brooks, Pablo Neruda, William Stafford, Emily Dickinson, William Butler Yeats, and others. According to the "Notes on Form" at the back of the book, they represent the current running through the lake. UPDATE: After thinking about this book so much, I have new details to input. The first review was written in July 2017, the updated version was finished in August 2017. I was sold on this book when I realized that this book was told in verse. This one sort of felt boring at times for me. I also realize that this is more a middle-grade novel, so I am not really the desired audience for this one. This book is told in three different perspectives, which is the lake, Abi, and Claire. What is unique is that each perspective has a different poetical format. Out of all of them, I found the lake to be the most interesting one. I didn't really like how depressive this book was. These girls have always spent a month at the cabin on the lake every single summer. A terrible accident has happened and their mother has passed away. What was weird to me was the girls seemed to have issues going to the lake after this with their dad and new mother, but the mom died when they were just babies which made it seem out of the ordinary for them to be so distressed by this trip. I felt like this book was "trying" to solve a problem when there wasn't one. The biggest problem is the fact that Abi is becoming interested in boys, which is having a negative effect on Claire. Which I think is a cute part of the story, but it certainly doesn't feel like the point of this story. I will admit this is a sweet story about sisters and family. Another major issue why I couldn't give this book more than two stars is that the younger sisters voice is really annoying, and seems a bit immature for a girl her age. It made the whole seem ridiculous and made me lose interest. My next issue is that these sisters are just odd and slightly immature for their age. Some of the characters are just so annoying and I very much disliked many of the characters. The last thing that seemed weird was that he continued to come to this little cabin after all the pain that was associated with this place. Which is something I cannot get over, it just seemed odd to take your new woman to some place as special as where your late wife was often. I believed also that the dad sort of forced this on the girls and failed to get enough grief counseling. Also while the writing is quite delightful and interesting, the fact that you really can;t seem to decide where to read the page when some poems have bolded parts, this was just rather frustrating as I have a reading issue when faced with challenges like that. The title is sort of click bait. Yes there is a love story in here, and someone wants to kiss a boy but it really didn't go anywhere at all. I thought it was cool how the first letter in each poem spells out something. That must have taken the author a long time to finish. You can tell lots of love went into this book. Recommended for fans of books written in Prose. Written for fans of realistic drama. Chloe loves coming to the cabin every summer with her older sister, Abigail, and her father. But this year, everything will be different. This time, her new step-mother, Pam, will be coming along as well. If that wasn't bad enough, a new baby brother will be coming very soon and Abigail doesn't seem to be as concerned about all the changes to the family like Chloe. In fact, all Abigail seems to think about is boy Recommended for fans of books written in Prose. Written for fans of realistic drama. Chloe loves coming to the cabin every summer with her older sister, Abigail, and her father. But this year, everything will be different. This time, her new step-mother, Pam, will be coming along as well. If that wasn't bad enough, a new baby brother will be coming very soon and Abigail doesn't seem to be as concerned about all the changes to the family like Chloe. In fact, all Abigail seems to think about is boys and kissing. Last summer was bad enough but this time, Abigail is starting to change right in front of Chloe's eyes. Not only has she started to wear makeup and worries about what clothes to wear to the beach, she has started to sneak out late at night and expects Chloe to help cover for her. Why is she so boy crazy all of a sudden? All Chloe wants is to return to the summers of the past but that doesn't seem to be happening. Will she be able to adjust to all of the new changes? This was a very nice book about two young sisters who find themselves at different stages of their life and trying to navigate their way forward. It is a story of growing up and learning lessons along the way. It is about family and how it changes as the years go by with new additions and unfortunately with some loss. There isn't really a plot of the book that makes you continue to turn the pages. Instead, it's the character development that keeps you reading. And it's the characters that you will remember long after you finish the last page. The only reason I gave this book a four out of five is due to the fact the point-of-view does switch between the characters of Chloe, Abigail and the lake itself. If you don't read the title of the poem, you might be confused as to whose voice is speaking. This novel written in verse is a wonderful summer read (or a winter read when you're dreaming of the warm, lazy days of summer). Claire is just about to turn eleven. Every summer, she stays at the family cabin with her sister, Abigail, and her dad, but this year things are very different. For the first time, her dad's new wife, Pam, is coming with them, and Pam is expecting a baby any day. Claire isn't very happy to find her mother's things removed, and the cabin set up to Pam's liking. And she's This novel written in verse is a wonderful summer read (or a winter read when you're dreaming of the warm, lazy days of summer). Claire is just about to turn eleven. Every summer, she stays at the family cabin with her sister, Abigail, and her dad, but this year things are very different. For the first time, her dad's new wife, Pam, is coming with them, and Pam is expecting a baby any day. Claire isn't very happy to find her mother's things removed, and the cabin set up to Pam's liking. And she's even less excited about the changes that she starts to see in Abigail, who now insists on being called Abi. Boys, kissing, sneaking out, keeping secrets...this is a new world for Claire, and she doesn't understand why everything can't just stay the same. This is a book about learning to adapt to change, and it is told in Claire, Abi, and the lake's points of view (I LOVE the lake's perspective on the girls and what's happening in their lives). I like how this book captures Claire's innocence; she's not interested in boys, and doesn't understand all the fuss about them, and yet she (and also the reader) get their first glimpse into Abi's new feelings. We watch as Claire copes with Abi's transition from her playmate, to a teenager who wants to spend time with friends and is interested in boys. It also addresses the feelings that many kids experience when a parent has a child with a new partner. Frost, Helen When My Sister Started Kissing, 187 pages. Farrar, Straus and Giroux, 2017. $17. Language: G (0 swears); Mature Content: PG; Violence: PG. Claire and Abigail always look forward to their vacations at their cabin. This year however, is a little different. Ten year old Claire and thirteen year old Abigail are going to their cabin with their dad and their new pregnant mom, Pam. The family is having a good time so far, but Claire is not comfortable with Pam yet. Claire also notices that Frost, Helen When My Sister Started Kissing, 187 pages. Farrar, Straus and Giroux, 2017. $17. Language: G (0 swears); Mature Content: PG; Violence: PG. Claire and Abigail always look forward to their vacations at their cabin. This year however, is a little different. Ten year old Claire and thirteen year old Abigail are going to their cabin with their dad and their new pregnant mom, Pam. The family is having a good time so far, but Claire is not comfortable with Pam yet. Claire also notices that her sister is acting different, she spends most of her time at the beach and mall than ever before. Claire just wishes things were back to normal. This book was great! I loved the characters and their personalities! I also liked how the story is very relatable. The one thing I did not like about it was the layout of the book. I do not like how the pages are typed like a poem would be typed. It is very annoying to flip a page every three seconds. Over all, it is a great book! I loved this book. And it is not about a bunch of kissing. Even though the book is written from three different perspectives--Claire (the younger sister), Abi (the older sister-the one interested in kissing) and the lake, I still feel the main focus on the book is on Claire and how her life changed that summer her family went to the family cabin at the lake (and her sister got really interested in boys). I love that this is written in poetry. The author writes each perspective using a different I loved this book. And it is not about a bunch of kissing. Even though the book is written from three different perspectives--Claire (the younger sister), Abi (the older sister-the one interested in kissing) and the lake, I still feel the main focus on the book is on Claire and how her life changed that summer her family went to the family cabin at the lake (and her sister got really interested in boys). I love that this is written in poetry. The author writes each perspective using a different form of poetry--(Abi) free-verse but also shaped at the same time, (Claire) quatrains (most of the lines rhyming) and (the lake)acrostics. When Claire takes the kayak out on the lake, the author includes shapes in those poems. Full admission... I’m a huge fan of Helen Frost’s books, always intrigued by her finesse with both story and poetic forms. The tender transition from girl to adolescent is a tricky one to write about in any form. This shift in hormones and hungers is viewed through the eyes of Clair, the younger sister, and Abi, the older one. Even the LAKE has a voice, one which uses acrostics to layer poetic quotations onto the deep currents of the all-seeing waters. The variety and suita Full admission... I’m a huge fan of Helen Frost’s books, always intrigued by her finesse with both story and poetic forms. The variety and suitability of various forms provide a rhythm and repetition to the shifting voices and choices of Abi and Clair. "When My Sister Started Kissing" is a wonderful book, written in different poetry forms. Helen Frost writes the narrative from the Claire's, Abigail's, and the lake's perspective, using a different style of poetry for each point of view. The flow and the tone of the story really captures the feeling of kayaking on a lake, taking the reader through the characters' experience of family, romance, emotions, and change. Recommended for grades 4-7. Lexile level 690. Reviewed by Christine Hwang, Youth an "When My Sister Started Kissing" is a wonderful book, written in different poetry forms. Helen Frost writes the narrative from the Claire's, Abigail's, and the lake's perspective, using a different style of poetry for each point of view. The flow and the tone of the story really captures the feeling of kayaking on a lake, taking the reader through the characters' experience of family, romance, emotions, and change.